It takes a tremendous amount of courage for a renowned scientist to break ranks with his fellow scientists, especially when it concerns a matter as serious as chemical geoengineering. Dr. Marvin Herndon has done just that and much, MUCH more. In the video posted below this fierce anti-geoengineering advocate speaks to the whole human race. His plea to the world community of nations is that the current form of global geoegineering be terminated post-haste. He has performed this vital service to humanity because he is grimly aware of the dire consequences to the biosphere posed by chemical geoengineering. In fact, the entire planetary environment has been placed in great jeopardy through the systematic, indiscriminate and wide-area spraying of chemtrail aerosols — 24/7. Dr. Herndon has presented critical data and information about the current geoengineering regime. 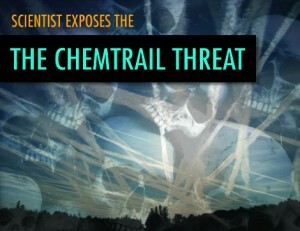 He has been the foremost scientific investigator among his peers, both through his courageous research and revelatory writings, concerning the dangers of the coal fly ash that is used in the chemtrail and chembomb aerosols. The very least that anyone can do to acknowledge Marvin Herndon’s bravery is to circulate this video however possible. He and his supporters can certainly use the protection that comes with such life-saving exposure. Widespread dissemination of his plea is quite necessary, particularly when conducting such dangerous research which proves that the U.S. Federal Government has been methodically poisoning the American people over many years. CITIZENS OF ALL NATIONS. We stand together united against a common peril. Planet Earth and her lifeforms are under assault. No, this is not an alien attack from another world. This is an attack by alien creatures that have risen among us, monsters whose unbridled ignorance, arrogance, greed, and thirst for power have no limits. Worse, the monsters have absolutely no concern for the well being of humanity, not even for their own families. UNIVERSITY SCIENTISTS should tell the truth. Instead, they deceive the public by talking about geoengineering as if it is some future possibility. Are their heads buried in the sand? Do they not see what is happening in the air above them? Do they not question? Have they no concerns even for their own families? ARTIFICIAL CLOUDS, sprayed by tanker-jets, have been reported with ever-increasing frequency for at least fifteen years. Since about 2013, it has ramped-up to full operational level over America and elsewhere on the globe. But what are they spraying? No answers from authorities. Just silence or lies. Why the secrecy? Why? Because there is strong evidence that the main substance they are spraying is coal fly ash, a toxic-nightmare that can be inhaled or enter through skin and eyes. Our bodies’ moisture is all that is required to release a host of toxins in chemically mobile forms, including aluminum, implicated in neurological diseases. The monsters are poisoning humanity. TO MEMBERS OF NATIONAL SCIENCE ACADEMIES, I say this: Tell the truth about what has been happening in the air above us, warn people of the dangers, the risks to health, admit that knowledgeable scientists have too little understanding of the Earth’s complex behavior to even consider geoengineering. TO POLITICIANS I say this: Serve the interests of the people who elected you. Stop this geoengineering insanity. TO THE INTERNATIONAL CRIMINAL COURT I say this: If you haven’t done so already, initiate an investigation into the crimes against humanity perpetrated under the guise of geoengineering. AND TO ALL THOSE WHO STRUGGLE to bring an end to this inhumane activity: I salute you. And I thank you. 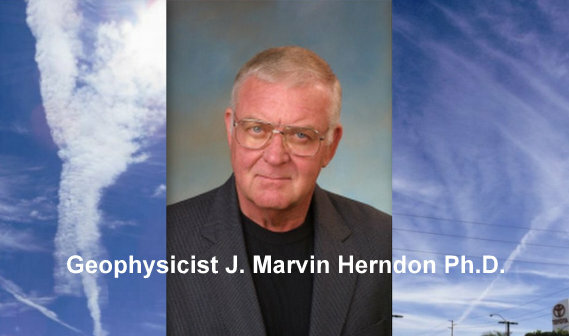 – J. Marvin Herndon Ph.D. The following video presentation provided the text shown above from Dr. Marvin Herndon internet plea to the world community of nations to stop the highly destructive chemical geoengineering programs.